This is an authorized aftermarket product. Fits with various LG brand models. It has a OEM part # ADQ73214404. 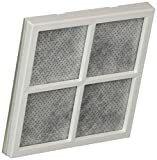 3 x Replacement for air filter ADQ73214402, ADQ73214404, LT120F out of 5 based on ratings.